To purchase an e-book for $7, go here. Deeper Still is God’s call to each one of us. God wants to bring us deeper in prayer and intercession no matter where we are in this journey of life. He wants to take us further in intimacy than we have ever experienced before. If this is your desire and if you want to have a deeper and more fulfilling prayer life, then this book is for you. Deeper Still: Secrets to a Deeper Prayer Life is designed for those who are learning to pray as well as those who are well-seasoned intercessors. In this book you will find many secrets to a deeper prayer life that is applicable to all ages and backgrounds. Deeper Still is designed in such a way that you can easily use it to teach others about the secrets to a deeper prayer life. The life application at the end of each chapter makes it easy to make it real in the lives of others as well as your own life. The chapters end with crafted prayers that you can pray again and again. With thirty separate teachings on prayer, you will learn a wide array of secrets to help you go deeper with God. May God richly bless you as you launch forth in this exciting adventure of intimacy with God. 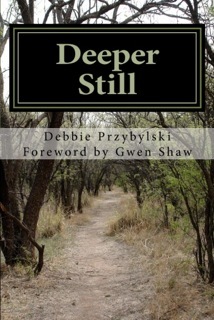 I pray that Deeper Still: Secrets to a Deeper Prayer Life prepares you for your destiny and journey with God in this changing world in which we live. God is calling you deeper still. Enjoy the journey. DR. GWEN R. SHAW, Founder and President, End-Time Handmaidens, Inc.